Water cooled systems are designed to circulate water or a water glycol (antifreeze) mixture and keep the temperature of the coolant at or near ambient. 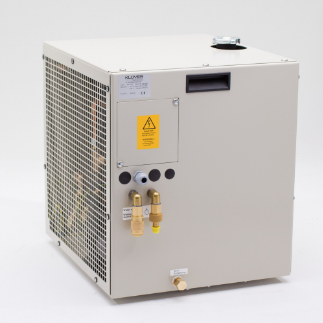 The WL Series is a re‐circulating liquid to air heat exchanger that offers dependable, compact performance by removing large amounts of heat from a liquid circuit. The coolant is re‐circulated using a high pressure pump to assure maximum flow rate. Heat from coolant is absorbed by a radiant heat exchanger and dissipated into the ambient environment using a brand name fan.